If you read Restricted Waters, you may have wondered if there was any truth to that part about marine mammals being used by the military. Absolutely. I wrote a little about it a while back. In fact, specially trained military marine mammals are considered highly valuable military assets–think Navy SEALS with no need for scuba gear. 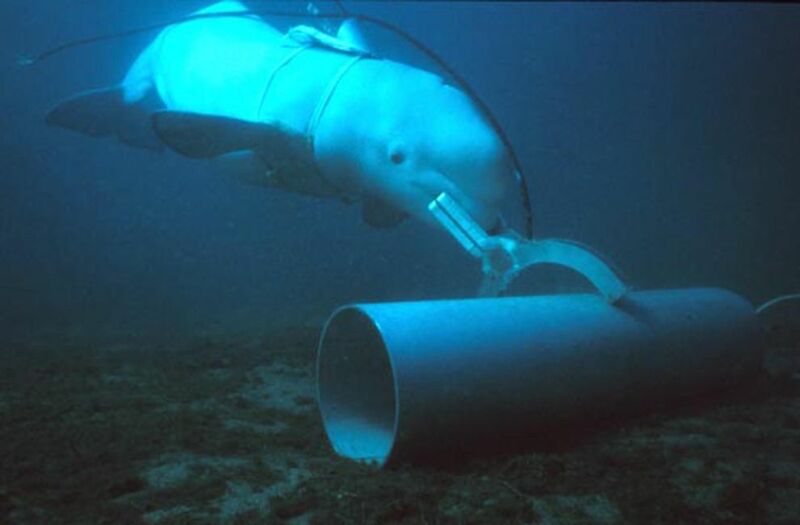 They can carry cameras and take pictures in restricted enemy waters, and they can be used to detect mines, scuba divers and other enemy survey equipment. According to the Russian News outlet Ria Novosti, there are only two combat dolphin training programs in the world. One is run by the U.S. Navy. The other is now under Russian command. Last week, as part of Russia’s take over of the formerly autonomous republic of Crimea, (in the Ukraine) the Russian military took custody of the Ukranian combat dolphin program. Other enlisted marine mammal species include sea lions, grey seals, Orcas and Beluga whales. Read more about the Navy’s Marine Mammal Program. National Geographic has a nice article explaining more about how marine mammals are used.